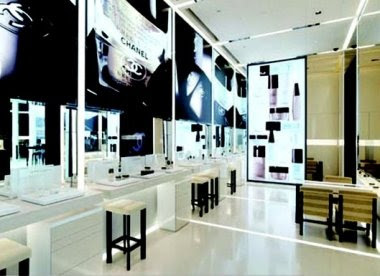 On The Rocks: Chanel Opens First Beauty Boutique in Tokyo! The 1,506 square-foot boutique with nothing but Chanel beauty products - perfumes/cosmetics/skincare opened today in Aoyama (which is like the new, hip, trendy, Rodeo Drive spot in Tokyo). Can't wait to check it out. I could seriously play in here all day... MAKE-UP HAVEN! According to WWD, the french designer decided on the concept long before Japan was hit by the recession... And unfortunately, Chanel does not currently have any future plans to expand it's sole beauty boutiques to any other locations. So if you want to check it out, book that ticket to Tokyo! I must make a note in my japan book to go here! Thanks! you should give out make tips/how tos!